It's been 79 days since Memphis International Airport, and the urban core of Memphis, have seen a low temperature below 70°. (If you're in the suburbs or outlying areas, you saw a morning or two of mid to upper 60s early this past week.) That is just 2 days shy of the all-time record for consecutive days with minimum temperatures at or above 70°, set back in - you guessed it - the scorching summer of 1980. (As a spoiler, we'll break that record on Wednesday morning.) For the period of June-August (commonly defined as "meteorological summer"), the average temperature this year has been 84.1°, which is good for 6th hottest "summer" on record. 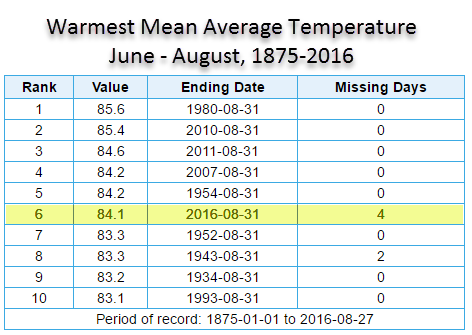 And we're just 0.2° from 4th place with daily averages the next two days around 86°. I'm done with summer. Unfortunately, as average temperatures come off their peak for the year and head towards typically more comfortable values in September, our weather pattern is acting like a two-year-old that isn't getting her way. It isn't budging. Summer-like high pressure at the mid levels of the atmosphere (about 20,000') will continue to dominate our weather pattern for the first half of the week, which results in subsiding air and above normal temperatures. Couple that with high pressure at the surface over the Mid-Atlantic and we're getting an easterly surface wind component. So while the Gulf of Mexico is not sending us moisture directly, we do still have a fair amount of humidity in the air. The good news is that in the afternoons as the air "mixes down" from aloft due to heating, drier air above us also comes down to the surface, so our afternoon dewpoints are lower than in the mornings, resulting in a little relief from the heat. It also makes for easier heating of the air due to lower moisture content, thus the 96-98° highs this weekend! 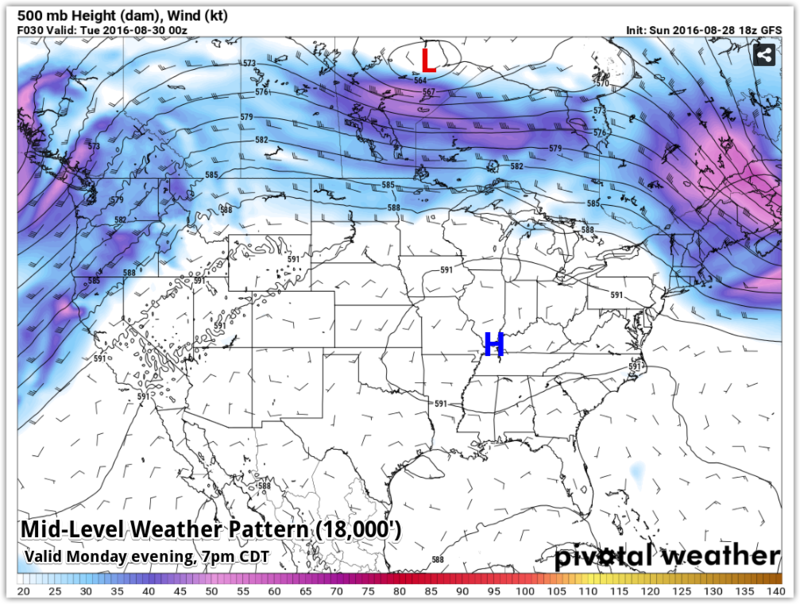 This pattern continues early this week with afternoon showers being few and far between and triggered only by atmospheric heating, while temperatures continue to reach the mid 90s. Heat indices will be in the 100-105° range from lunchtime through late afternoon. Act like it's summer, because it is, and don't overdo it. 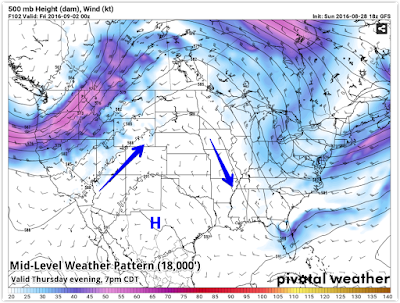 As we get into the latter half of the week, the upper air patter breaks down as a trough forms in the northeast U.S. and an upper level ridge rebuilds to our west, over the Plains. 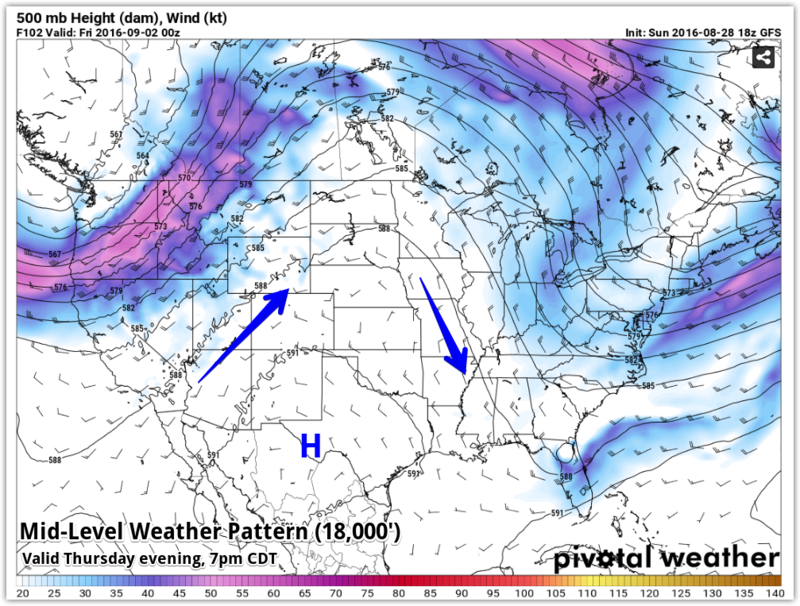 This puts the Mid-South in "northwest flow" aloft, which will allow a weak front to move through the area by Thursday. While temperatures may only be a bit cooler (right now I still expect 90° each day late this week), dewpoints will fall thanks to drier air from the north moving into our area. The drier air will mean more comfortable, if still warm, conditions and most likely some morning lows in the 60s, especially outside the urban core. 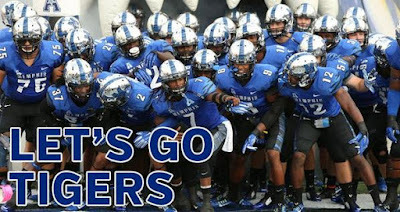 Rain chances drop to nil for the end of the week and next weekend - good news for Tigers fans looking forward to the first tailgate opportunity of the year on Tiger Lane and kickoff to the 2016 college football season! 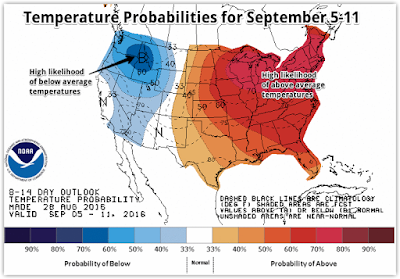 Unfortunately, the long-range forecast continues to lean heavily towards above normal temperatures well into September. Fortunately, "above normal" is relative and 90° will be above normal in another week as average highs fall into the 80s. Hopefully a good taste of fall is coming soon! 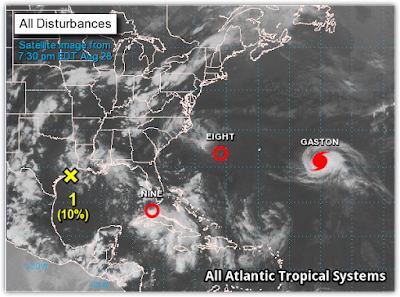 "99L" has been watched closely for well over a week as it passed through the Caribbean with some "reliable" models portending doom and gloom for portions of the U.S. Today, between south Florida and Cuba, it finally achieved "closed circulation," which means it is now a tropical depression (#9). 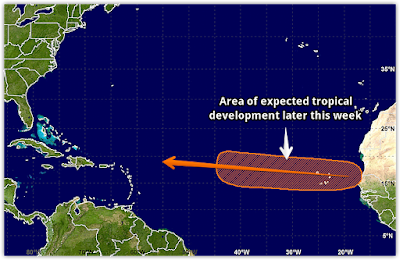 It is on it's way to becoming a tropical storm, or potentially, a hurricane in the Gulf of Mexico. The future track is still uncertain, but should get clearer in the next couple days. Most likely scenario is a trek into the south-central Gulf and then a turn to the north or northeast with landfall somewhere between the MS/AL coasts east into Florida north of Tampa. Florida hasn't had a hurricane landfall in 11 years. Could this be it? The NHC forecast track of Tropical Depression 9. This track is still fairly uncertain and likely to change somewhat this week. All interests in the eastern Gulf of Mexico need to keep a close eye on it. A new system, "91L," also became a tropical depression (#8) today, much more quickly than it's predecessor 99L. T.D. 8 is located between Bermuda and South Carolina, but moving west towards the Carolina coast. It should make a close pass to the Outer Banks on Tuesday before also making a hard right and retreating back into the Atlantic. The first of these two depressions to strengthen to a Tropical Storm will be called "Hermine" while the latter will be "Ian." The NHC forecast track of Tropical Depression 8, which will have a close encounter with the NC coast. 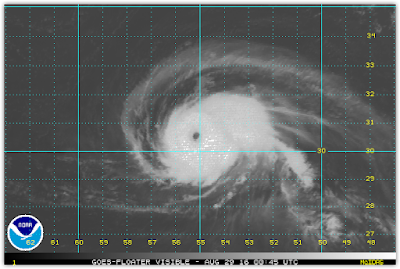 Hurricane Gaston is well out to sea and poses no threat to the U.S. as it moves northeast. Finally in the Atlantic, a new wave that emerges off the African coast in a day or two is already forecast by long-range models to make the long trek across the Atlantic and make a run at the Caribbean and/or U.S. in about 10 days to 2 weeks. That's a LONG way out, but it's one that shows potential for strong development and will be worth watching. In the Pacific, a rare "double threat" is being monitored in Hawaii as Tropical Storm Madeline and Hurricane Lester both eye the big island over the next week or so. The NHC forecast track of Tropical Storm Madeline as it threatens the Big Island mid-week, remaining a Tropical Storm. Following Madeline, Hurricane Lester also has Hawaii in it's sights, according to the NHS forecast track. Hang in there, cool weather fans! The pumpkin spice is appearing, which means that fall can't be that far away!